Belina's Adventures: Cholula, our neighbors to the West and a VERY interestinga and colorful place! Cholula, our neighbors to the West and a VERY interestinga and colorful place! 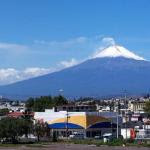 Just 15 Km to the West of Puebla via the Cholula Highway, sits the city of Cholula. Actually, there are two Cholulas, San Pedro Cholula and San Andres Cholula, there's even a third completely rural one called Santa Isabel Cholula. All are neighboring towns too. They are all about 7000 feet about sea level with very good climates and also sits close to the volcano ring surrounding the Valle de Puebla. Cholula, or in Nahuatl Cholōllān, was an important city of pre-Columbian Mesoamerica, dating back to at least the 2nd century BC, with settlement as a village going back at least some thousand years earlier. Cholula was a major center contemporary with Teotihuacan and seems to have avoided, at least partially, that city's fate of violent destruction at the end of the Mesoamerican Classic period. Cholula thus remained a regional center of importance, enough so that, at the time of the fall of the Aztec empire, Aztec princes were still formally anointed by a Cholulan priest in a manner reminiscent, and perhaps even analogous, to the way some Mayan princes appear to have come to Teotihuacan in search of some sort of formalization of their rulership. At the time of the arrival of Hernán Cortés Cholula was second only to the Aztec capital Tenochtitlan (modern Mexico City) as the largest city in central Mexico, possibly with a population of up to 100,000 people. In addition to the great temple of Quetzalcoatl and various palaces, the city had 365 temples. During the Spanish Colonial period, however, Cholula was overtaken in importance by the nearby city of Puebla. Cholula is most famous as the site of the Great Pyramid of Cholula, the largest man-made pyramid and monument by volume in the world. The temple-pyramid complex was built in four stages, starting from the 3rd century BCE through the 9th century CE, and was dedicated to the deity Quetzalcoatl. It has a base of 450 by 450 m (1476x1476 ft) and a height of 66 m (217 ft). According to the Guinness Book of Records, it is in fact the largest pyramid as well as the largest monument ever constructed anywhere in the world, with a total volume estimated at over 4.45 million m³, even larger than that of the Great Pyramid of Giza in Egypt which is about 2.5 million m³. However the Great Pyramid of Giza is higher at 138.8 m (455 feet). The Aztecs believed that Xelhua built the Great Pyramid of Cholula. Today the pyramid at first appears to be a natural hill surmounted by a church. This is the Iglesia de Nuestra Señora de los Remedios (Church of Our Lady of the Remedies), also known as the Santuario de la Virgen de los Remedios (Sanctuary of the Virgin of the Remedies), which was built by the Spanish in colonial times (1594) on the site of a pre-Hispanic temple. The church is a major Catholic pilgrimage destination, and the site is also used for the celebration of indigenous rites. Many ancient sites in Latin America are found under modern Catholic holy sites, due to the practice of the Catholic Church repurposing local religious sites. Because of the historic and religious significance of the church, which is a designated colonial monument, the pyramid as a whole has not been excavated and restored, as have the smaller but better-known pyramids at Teotihuacan. Inside the pyramid are some five miles (8 km) of tunnels excavated by archaeologists. As part of the Puebla urban area, Cholula is famed locally for its lively night life. Its town centre and zócalo area are filled with a wide range of bars and restaurants that are popular with young people from local areas and especially from the nearby Universidad de las Américas (University of the Americas, Puebla, or UDLAP for short). The city is also the namesake for Cholula hot sauce. The UDLA as people call it here has quite a few foreigners both as staff and students and you can see both walking around the Zocalo and enjoyin the local color. The Zocalo area is lovely, full of shade trees, restaurants and little traffic. Cholula has also been called "the city of the churches" and the saying goes that there is a church for every day of the year and for a small city, that's a lot of churches! 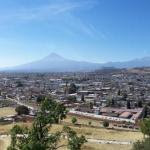 San Pedro Cholula.- The municipality incorporates most of the urban areas of the city of Cholula de Rivadabia (Cholula), which is the San Pedro Cholula's most populous locality and is the seat of the municipal g overnment (Spanish: cabecera municipal). Located in the state's Angelópolis administrative region, the municipality covers an area of 51.03 km² (19.7 sq mi), situated approximately 7 km (4.3 mi) to the west of the state capital, the city of Puebla. San Pedro Cholula and several neighboring municipalities are included within the Greater Metropolitan area of Puebla, a conurbation which extends also into the state of Tlaxcala. According to INEGI figures, San Pedro Cholula had a population in 2005 of some 113,436 inhabitants. The Angelopolis section of both Puebla and San Pedro Cholula is THE upscale area of the city, dotted with shopping centers, restaurants, condominium towers and businesses catering to a luxury market. While still very close by to the Colonial center of Puebla, it straddles both worlds easily and you can see a stark contrast while driving in the area when you pass by historic and Colonial buildings in cobblestone streets and antique street lamps and then you're in the middle of modern highways that lead you into very upscale, glass and concrete skyscrapers and modern shopping centers offering all the European designers latests wares to the favorite electronic games and gizmos you can think of. This area offers anything and everything you could want or need.